WHY GO: Far from the hustle and bustle of Nassau and Freeport, the Abaco Islands offers a quieter alternative. Bahamians call the 130-mile strip of islands in the northern Out Islands the “Family Islands” because that’s where they go to relax. Recreation is of the annual boxcar races and flag football tournament variety. Instead of built-up attractions, the Abaco Islands offers pastel-pretty gingerbread houses, long stretches of empty white sand beaches, and translucent shallow waters teeming with technicolor coral reefs. VISIT: Elbow Reef Lighthouse at Hope Town. 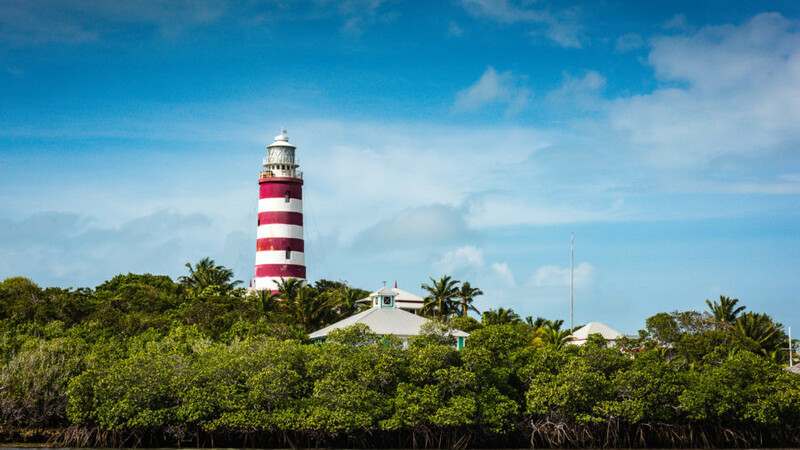 For the best view of Hope Town and the Sea of Abaco, climb the 101 steps to the top of the red and white candy-striped Elbow Reef Lighthouse, one of the last kerosene-powered lighthouses in the world. At over 80 feet high, the 360-degree perspective from the gallery deck is spectacular–but not for those afraid of heights. VISIT/SHOP: Winnie Malone Historical Museum. The Abaco Islands have a fascinating history, including being settled by British loyalists fleeing revolutionary America. Discover that story and that of Lucayan Indians, pirates, wreckers, and rum-runners in the period displays. As you exit, be sure to check out local crafts–straw bags, hand-batik fabrics, and landscape prints–in the gift shop. SNORKEL: Everywhere. With much of the water surrounding islands measuring 20 feet deep or less, and little or no waves, conditions are ideal for snorkeling. Healthy coral reefs, teeming with colorful fish, can be found at Hope Town Reef (easy access from the beach at Hope Town Harbour Lodge, an Ascend Hotel Collection Member.) For the very best snorkeling, hop on a boat to go to Sandy Cay Reef or Fowl Cays National Park. CHARTER: Captain Plug’s Adventures. There’s no getting around it. 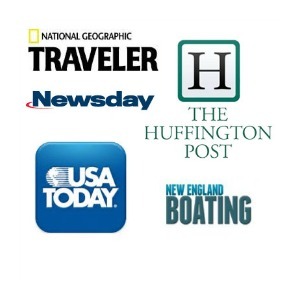 If you want to explore all of The Abacos, you will need a boat. But if you want to find all the secret spots known only to locals, you will do well to hire Stafford Patterson, an 8th generation Bahamian. On a three-hour tour, I was able to swim with pigs on No Name Cay and snorkel at Mermaid Reef, but I also got to see Treasure Cay, Great Guana Cay, Man-O-War Cay, and even the film setting for that long forgotten George C. Scott film, The Day of the Dolphin. SHOP/BIKE: Hope Town Canvas/The Bike Shop. Rent a bike to explore 8-mile-long Elbow Cay, and shop for a one of a kind funky sail bag while you’re at it. Housed in one cottage in Hope Town, this is also where you’ll find Jacob Adams Rum, produced by a direct descendent of the eponymous Loyalist settler. FISHING/DIVING: I didn’t have a chance to do it all on my whirlwind getaway, but here are a few more activities recommended by locals. Try bonefishing, typically a catch-and-release exercise, with Local Boy Deep Sea Fishing. Plan a dive trip with Froggies Out Island Adventures. GETTING AROUND: Getting around The Abacos can be an adventure in itself. Car rental are limited to the mainland of Abaco, and on Marsh Harbour and Treasure Cays. On other cays, you can rent a bike or golf cart. Check your hotel for availability (Hope Town Harbour Lodge, an Ascend Hotel Collection member makes its fleet available to guests, often at no charge.) During high demand periods, make reservations with island rental companies such as Hope Town Cart Rentals well in advance. Travel between the main islands–Marsh Harbour, Man-O-War, Guana Cay, and Elbow Cay–via Albury’s Ferry Service. Ferries run frequently every day, with additional late service on weekends; private charters available upon demand. Bahama’s National Drink, the flavored rum Goombay Smash, originated back in the 1960s at Miss Emily’s Blue Bee Bar on Green Turtle Cay. That recipe is still a closely-guarded secret, but you can find delicious variations at most bars and restaurants throughout the Abaco Islands. Bahamian cuisine leans heavily on abundant seafood. Do try the “cracked conch,” a deep-fried version of the mollusk. Also, we love the Bahamian twist on battered fish which adds shredded coconut to the tasty coat. BREAKFAST: Reef Restaurant & Bar. Breakfast and lunch served between pool and beach at Hope Town Harbour Lodge, an Ascend Hotel Collection Member. Buttermilk pancakes are a crowd pleaser, and the healthy choice menu is extensive, but if you like local flavor, don’t miss the “Fire Engine” Breakfast Special of corned beef and grits. At lunch, look for the Conch Burger. EAT: Cap’n Jacks. All day hang out spot, where locals and visitors, meet up, Cap’n Jacks serves breakfast, lunch, and dinner. Set right on the water by the docks, enjoy a Goombay Smash and a Coconut-Battered Mahi Mahi with a view of Hope Town’s iconic lighthouse. DINNER: Firefly Bar & Grill. Go for the sunset, stay for dinner. Visitors rave about the Firefly Bar & Grill; rated #1 on TripAdvisor, the menu features steak, lobster, and all the usual favorites. DINNER: The Great Harbour Room. Dine indoors at a candlelit table in air-conditioned comfort at Hope Town Harbour Lodge’s Great Harbour Room. Chef Pherrol puts a twist on the traditional surf and turf with a Reef & Beef featuring Bahamian lobster and he takes the Coconut-Battered Fish to another level with a coconut rum marinade. Do leave room for dessert; you won’t want to miss the rum cake with rum raisin ice cream. STAY: Hotels and villa rentals are available on all the major islands within The Abacos. We recommend staying on Elbow Cay as it is central to all The Abaco Islands, while offering multiple restaurants and lots to do. And yet, even with friendly locals and plentiful amenities, you can still find a spot where you can have a beach all to yourself. Base your relaxed Bahamas vacation at the historic, comfortable, and affordable Hope Town Harbour Lodge (Mavens Review HERE,) an Ascend Hotel Collection Member. Situated in colonial Hope Town, right on one of the Abaco’s top beaches, accommodations vary from lodge rooms to private oceanside cottages. Disclosure: Choice Hotels hosted Getaway Maven Sandra Foyt’s stay at Hope Town Harbour Lodge and covered all trip expenses. As always, our opinions are our own. Please refer to our Editorial Policy for more details.